Inso's World: A Dwarfy problem. Hello again and welcome to Inso's World on a fine Sunday morning. Chopping up tree into logs. St. Patrick's Day drinking and karaoke. Six Nations rugby... and recovery. Now that is out of the way, let's talk about an interesting development in the world of GW miniatures... namely, the new Age of Sigmar Duardin miniatures and models. So... we have all got our heads around the fact that Warhammer Fantasy turned into Age of Sigmar and that things immediately went pear-shapes because... round bases and non-point based armies. Then came the Sigmarines... giant, heavily armoured angel-knights that dwarf notmal men. This was followed by all the other races getting swept up in PDF format and the introduction of new ranges of miniatures. Now, the latest new range is on the horizon and it has caused a bit of a stir in the WH40k world because... Squats (or not). The Duardin seem to be a race of Dwarf, steam-punk, sky-pirates who float about in anti-gravity blimps. I expect that the anti-gravity side of things is 'arcane technology' rather than anything believeable... like helium. Unfortunately, the anti gravity side of things seems to be metal clad balloons. 3 anti-gravity blimps of varying size. Lightly armoured sky pirate troopers. Heavily armoured sky pirate support troopers. 4 heroes in varying armour and ranging from leader to engineer. 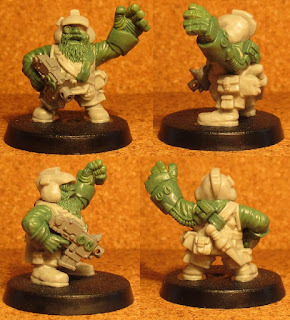 A lot of people are saying "they are good to go as Squats" others are saying "with weapon swaps, they are good to go as Squats" but I think that they are not good to go as Squats unless you have already started building your Squat army from fantasy dwarfs. I would like to think that there are a few components that could be used but having looked at the images closely, I think that these Dwarfs will be in excess of 25mm tall so will be a little tall for my army. Add to that the fact that there is steam powered stuff all over the place and fantasy styled weapons (cannons and flint lock pistols), I am struggling to think of much that is salvageable... or worth buying... for a Squat army. Onto the heavy armour. It is very nice and would likely make a nice basis for Exo armour or heavy armour for a Hearthguard unit but with the height thing in mind, it may be a bit of a tall order (pun intended) to fit them into my army... and the steam aspect may be difficult to remove. There are also some design aspects that I don't like. The anti-grav balloons, the overly ornate helmets with top hats and monacles and the jarring mix of fantasy and tech weapons all make me cringe a little bit. It's all a bit 'Barron Munchausen' for my tastes. I imagine that these Duardin will fly off the shelves (pun intended) and will be used by many WH40k collectors as the basis of a Squat army but I won't be one of them. Don't get me wrong... as an Age of Sigmar army, I think they fit in perfectly well and are definitely an interesting idea... but WH40k isn't Age of Sigmar and these troops just don't work as Squats for me. Captain Bjorn Thorsson 'Hammer Hand', Leader of the second company of the League of Forges' infantry. See you from the iron throne! Generally speaking. Nope, not even generally speaking - unequivocally, I prefer yours. They remind me of the 1984 ones. When I first saw them I became tempted to use them as the basis for my Squat Genestealer Hybrids. But I'm already 3/4 through 10 different ribbed armour Squat bodies to cast up & I'm sure the scale creep will mean these new AOS dwarves are way too tall. I still haven't started and 1st & 2nd generation bodies. May use the basic troop bodies as the basis for them as they can afford to be bigger. We're tempted to get some for Rogue Stars, and a flying ship...well, just because! As for a Squat army, I'll pass as I already have an army of Hasslefree's Grymn that I use as Squats in 30k. I think that there are uses for these new Duardin... just not in my army of Squats. @Zzzzz - The 1984 ones ARE Squats so that is exactly why I chose the plastic ones to work from. Originally, I thought about buying the metal ones but realised it would be hugely expensive and there would be less uniformity (seeing as I always planned to put them in an Astra Militarum list). @ Scott Prince - Never judge your work by what you see from others. Judge it against what you have achieved before and as long as you are improving as you go, you are doing a great job. Practice, patience and a little bloody mindedness is all it takes... I've been sculpting for 30+ years. @ Da Masta Cheef - I don't need to say how much I love Grymn so they are a good choice for 'off the shelf' space dwarfs to me. In other settings (ie NOT Squats) those floaty-boats would work a treat (John Carter of Mars, Victorian sci-fi and possibly transport on alien worlds) so I can understand why you'd give it a go.